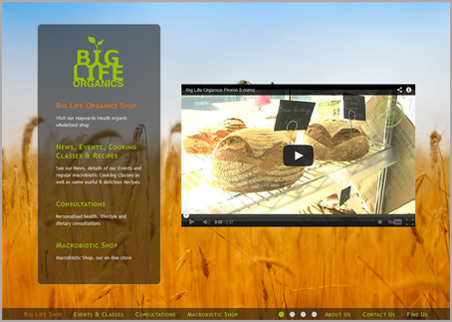 Big Life Organics is a high quality specialist food store offering cooking classes and consultations. They required a colourful, graphically rich site with a Content Management system enabling them to edit their content themselves. Using their bespoke backend they are able to update all the web site images and text as well as add new cooking classes, events and recipes. Cooking classes and events automatically drop off the front end once they have taken place. The site is search engine optimised and gets top place in Google for relevant searches which include their town, Haywards Heath, in West Sussex. All pages including the added cooking classes, events and recipes have search engine friendly URL's and their site map is updated for Google each time a cooking class, events or recipe is added.